Return Policy: A full refund for the price of the merchandise will be issued on all merchandise returned within 10 days of the original shipment date. All merchandise must be unworn and returned in original box. Original and return shipping costs are non-refundable, unless the merchandise was shipped incorrectly. Shipping: We ship UPS Ground Service unless otherwise noted by the customer. Please allow 1-7 BUSINESS days for your order to arrive based on your location and which product(s) you choose. Our Guarantee to you: If you are unhappy for any reason with a Product, return it to us, prepaid, within 30 days in its original condition for an exchange or refund. Limited One Year Warranty: All products which are manufactured by Bluewater Towers and Tops are warranted against defects in materials and workmanship for a period of one year from date of purchase. This warranty applies only to the original owner. This warranty does not cover damage from accidents, failure to maintain properly, negligence, or normal wear and tear. This warranty is void if repairs have been attempted or made by any unauthorized person. 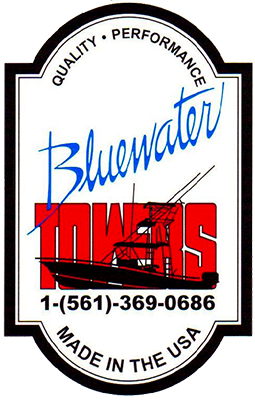 If for some reason your product has a defect within the terms of this warranty, contact Bluewater Towers and Tops. If the product is covered by the provisions of this warranty we will repair or replace the product, at our option. If, however, we determine that the repair is not under the provisions of this warranty, the product will be repaired at a reasonable charge for labor and materials. If the defective product is small enough to UPS, send to Bluewater Towers and Tops prepaid. All other products supplied by but not manufactured by Bluewater tower and Tops are subject to manufacturers warranty. Questions: Please click here to contact us!